Art Edwards - Laying Down the Law: My Piece on the Writing and Publication of my Story "Waiting for the Answer" (City of Weird) up at Necessary Fiction!!! My Piece on the Writing and Publication of my Story "Waiting for the Answer" (City of Weird) up at Necessary Fiction!!! I'm always fascinated by the elements that make a story go--whether it be a book, a film, a TV show, an essay, or something else--and I'm at least as fascinated by what's missing when it doesn't quite. 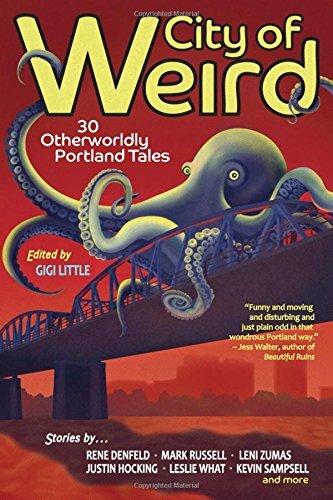 The latter was the case with my story "Waiting for the Question," also known as my Alex Trebek story, which I worked on for years until it finally came together and was published in the brand new anthology City of Weird, brought to you by Portland publisher Forest Avenue Press. Necessary Fiction has done me the honor of publishing my short essay on the process of writing and publishing "Waiting for the Question," which includes details of how Forest Avenue's Laura Stanfill and Gigi Little emailed Alex Trebek to get his permission to publish the story in the anthology. Yeah, that's gonna work, right? Read on, my friend, and be amazed. Buy Forest Avenue Press's City of Weird anthology. Because What's Weirder than Alex Trebek?